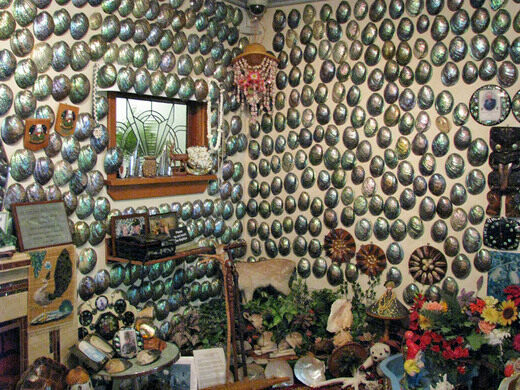 For 40 years Fred and Myrtle Flutey decorated their New Zealand home with thousands of paua shells that Fred had collected from the nearby beach. The shells quickly became the defining feature of the house, turning the couple’s home in Bluff into a celebrated tourist attraction. The house’s exterior gave little indication of the spectacular collection within, but once inside, visitors were ushered into the couple’s famous Shell Lounge. Paua shells occupy nearly every surface of this extraordinary living room, their iridescent surfaces creating an effect that is almost overwhelming. Clocks, telephones, picture frames, and various other knick-knacks were all incorporated into the shell motif. Visitors added to the chaotic surroundings by leaving calling cards wedged between the shells and the wall. Enchanting, kitschy, even tacky – however you choose to describe it, no one can deny the Fluteys’ dedication to their collection. When the Fluteys died in the early 2000s, their grandson purchased the house and loaned the shell collection to the Canterbury Museum, despite the protests of some Bluff residents who objected to the shells’ relocation. The museum recreated the Fluteys’ lounge in painstaking detail, working from photos of the original lounge and using much of the original furniture and decorations. The exhibit was opened to the public in 2008 and includes a short film about the Fluteys and their unusual obsession.